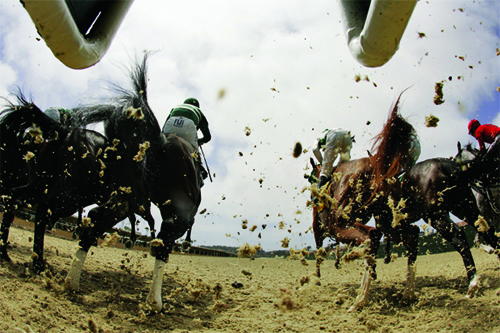 American Turf Monthly has been helping horseplayers pick winners for six decades. Unpretentious articles about angles, the best ways to decipher class in the Thoroughbred, money management, and high-tech handicapping makes American Turf Monthly the perfect publishing vehicle - we make our readers more successful. It's the only monthly magazine available for students and practitioners of Thoroughbred handicapping. ATM also lists horses to watch at major & minor racetracks in the "Fit and Ready to Win" section, a steady, popular source of longshot winners & exactas. The only monthly magazine for horseplayers. The only handicapping magazine sold on newsstands nationwide. The only magazine with winning "horses to watch" at racetracks from coast to coast. The most experienced and best writers on Thoroughbred racing. Following and promoting horse racing since 1946. "I recently received the May copy of American Turf Monthly and was pleased that it was a Triple Crown Special. After reading the article, "Handicapping the Derby: The Edge Goes to a Horse of Another Color . . ."by Stanley Caris, I decided to follow the 11 angle formula and found myself betting on Funny Cide, much to my delight...By the way, thanks again for providing a formula that worked so well for the Derby. I settled on Funny Cide the Wednesday before the race and felt confident up to the second he came under the wire (well, I did think that when Empire Maker came up on the outside he might have taken him, but he was in my exotic anyway!)." "Your May edition of American Turf Monthly has proven quite profitable so far. First on April 30th at Delaware Park, Patty Cakes (Charlestown selection) won/paid $41.20. By the way, Penny's Halo (Delaware selection) just missed by a nose to complete the exacta. Penny's Halo came back to win her next race paying $12.00. Second, Stanley Caris' "Handicapping the Derby" article noted both Empire Maker/Funny Cide as highest point totals in the field (this was confirm thru your internet site). Kudos for Stan. Finally this past Saturday @ the Preakness, your Delaware selection, Dr. Brendler won the Citgo Dixie paying $39.40. Again, excellent job. Keep up the good work."